If you ask us, wild Alaskan salmon is basically pink gold, which means there’s never a good reason to let any of it go to waste. Fortunately, leftover salmon is a key ingredient in plenty of no-fuss, tasty recipes out there, and usually makes for a quick and satisfying meal. Poached eggs, smashed potatoes, and flakes of wild salmon…you’ll actually want to make too much fish for dinner just so that you can eat this decadent salmon hash the morning after. This recipe is a three pot/skillet operation — the eggs are of course poached in a separate skillet than the hash, plus you have to boil the potatoes before frying up — so this is best for a relaxing weekend brunch. Skip the bacon if it’s is not your thing and simply replace with a bit more butter, or use coconut oil as your cooking fat. Feel free to use leftover roasted or mashed potatoes to complete this dish. You can even use sweet potatoes for a sweet and savory twist on hash. Is there anything better than a creamy bowl of chowder? To spice up this rendition of wild salmon chowder, try replacing the dairy components with one can of unsweetened coconut milk — and maybe add a couple tablespoons of your favorite curry paste, a squeeze of lime juice, and fresh cilantro. Easy and scrumptious, these fish patties combine leftover salmon with the texture of panko breadcrumbs to make a meal that even picky eaters can appreciate. The patties are fried in a bit of oil and butter, and served hot with a squeeze of lemon or accompanied by homemade tartar sauce. You can even make a large batch of these salmon patties to stash in your freezer for future use. The best way to keep them is to freeze the patties while they are uncooked, as they will be more moist and flavorful upon use. Simply store flat in a freezer-safe bag or container, using parchment to separate each layer of patties from the next to prevent them from freezing to each other. Tonight’s leftover poached salmon becomes tomorrow’s French Riviera-worthy lunch in this easy take on the salade Niçoise. Rather than using oil-packed anchovies to complete this dish, this recipe replaces features tender flakes of poached salmon. All you have to do is whisk up the dressing, boil a few components — eggs, potatoes, and green beans — and arrange everything over a bed of crisp greens. 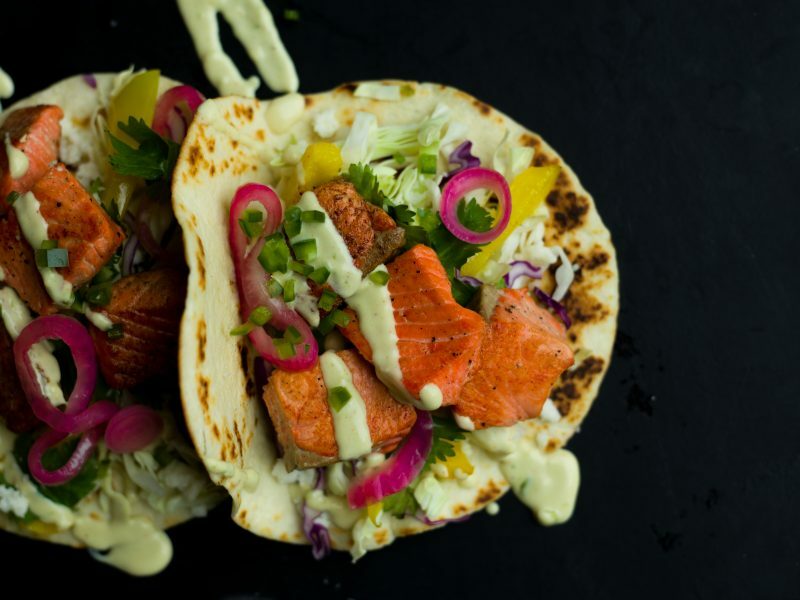 Elevate your fish taco game with leftover wild salmon. All you need to do is prep a simple cabbage slaw and mash up a few ripe avocados, and you’re ready for a gourmet taco dinner, thanks in part to your Alaskan catch. Heat up chunks of salmon with some soft tortillas and serve immediately. A creamy garlic sauce, balanced with the acidity of fresh lemon juice, is the perfect accompaniment to leftover salmon in this decadent pasta dish. While the pasta is cooking — this recipe calls for fettucine, but any pasta will do — you will have plenty of time to make the delicious cream sauce. Mix in chunks of salmon when the sauce is nearly thick enough to coat the back of a spoon. After another minute or two, the sauce will be ready, the salmon will be warmed, and you can toss in drained pasta. Serve immediately, garnishing with fresh parsley and grated parmesan. This recipe for salmon and gruyere quiche is crustless. It resembles a frittata and is just as easy to make, but it has that gooey, creamy center that you’re looking for when you stick your fork into a slice of quiche. Have leftover salmon and leftover rice taking up space in your refrigerator? Fried rice is an ideal way to repurpose both of those ingredients into a stellar meal that comes together in under 10 minutes. Note: You can use freshly made rice as well, but leftover rice tends to fry up better due to the fact that it’s been dried out a bit by a night or two in the fridge. Ready For Some Wild Alaskan Seafood? By reserving your monthly seafood share, you’re helping build a more sustainable food system that’s better for humans and fish alike. © 2019 Wild Alaskan, Inc.